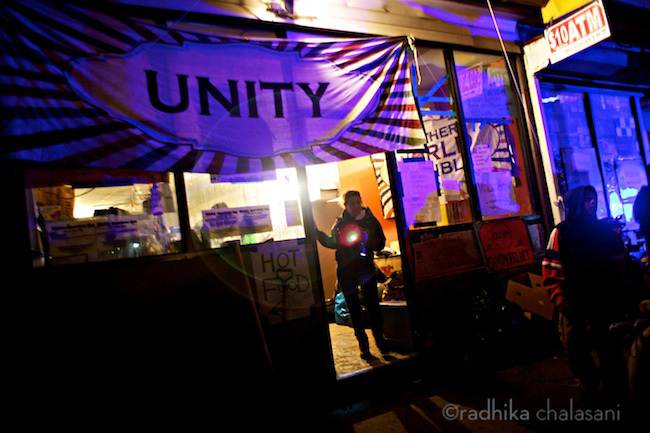 This photo was taken outside YANA (You Are Not Alone), a community centre, Occupy Sandy was using as a hub for their relief efforts in the area. 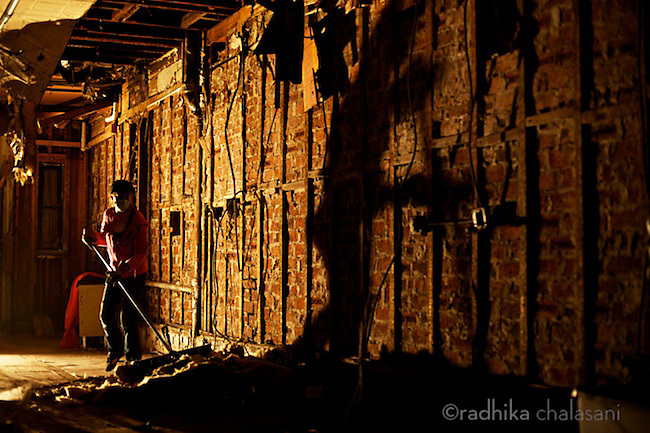 Most of the Rockaways was still without power nearly two weeks after the storm. YANA was this small oasis of activity and light in the darkness thanks to the Greenpeace truck in the background providing solar generator power. The woman wearing the mask is Sofia Gallisa Muriente, one of the Occupy organizers in the Rockaways. Sofia first went to Zuccotti Park September 17, 2011 mostly curious about what was happening. She slept there the first night and then kept going back and getting more involved. She became the founding editor of IndigNacion, the only Spanish language publication to come out of OWS. She says she found a community of “strong, beautiful, idealistic strangers” and was happy when they reacted to help after Sandy. She’s been in the Rockaways since two days after the storm; first to help her best friend clean up her house and then working out of YANA. The group at YANA just incorporated as Restore the Rock to plan for the long haul. The worst of Superstorm Sandy is readily apparent for those who experienced the storm directly or saw the nightly news images. The best thing I can say about Sandy is that I’ve gotten to know my city a little better and have met people I would never have met. More importantly, I saw an amazing outpouring of volunteerism. I only photographed the Occupy Wall Street movement once, but followed the stories and was interested in their emergence as a relief organization in the days after the storm. 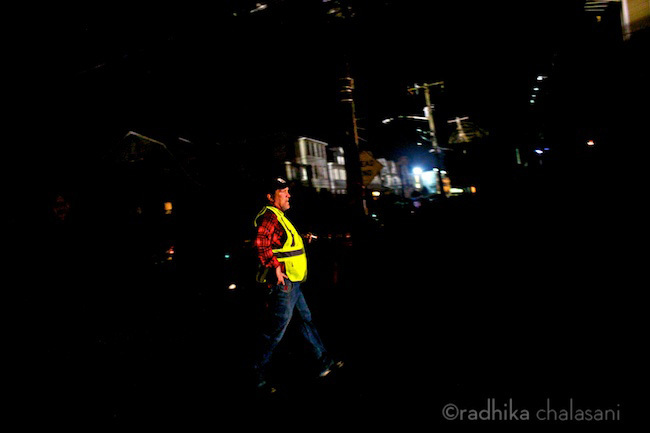 Superstorm Sandy created so much chaos and loss, but so many people were volunteering all across the area on an incredible scale. It was the image of Sofia that made me focus on Occupy Sandy for a story. It isn’t hard to find people with negative views of Occupy Wall Street even when those same people would say they generally agreed with many of the ideas. Several of the residents of the Rockaways, who’ve most benefited from Occupy Sandy, said they hadn’t thought much of the protestors, but receiving help and meeting the people involved have changed their minds. I think it’s safe to say that without Occupy Wall Street there wouldn’t have been an Occupy Sandy. Through the protests they built a network of supporters and a communication system. They have the tech savy that comes naturally to a generation that grew up in a social media/internet world. They have the idealism (and some may say the arrogance) of youth to believe their way is better as well as the energy to put their ideas into practice. I have a new found appreciation for their tools: Facebook, Twitter, Google Docs and Google Voice. While other agencies and non-profits may have had experience responding to disasters they were also mired in typical bureaucracy and stuck in somewhat traditional thinking. 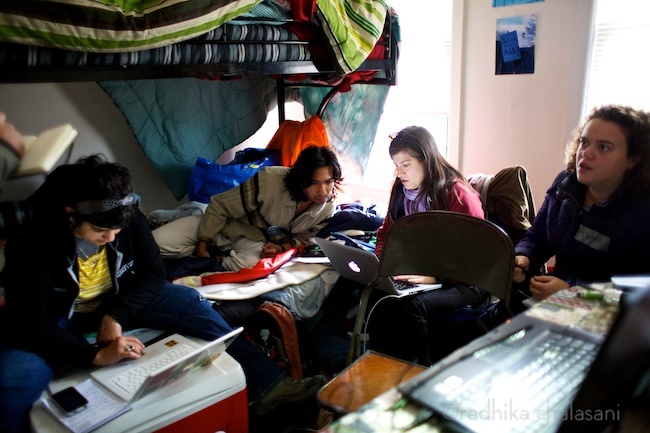 Occupy Sandy wasn’t the only group using social media, but they mobilized on a larger scale than others. In a way, Superstorm Sandy gave them the stage to put their ideas and their social activism to work at the community level. It’ll be interesting to see what they accomplish in the long term. 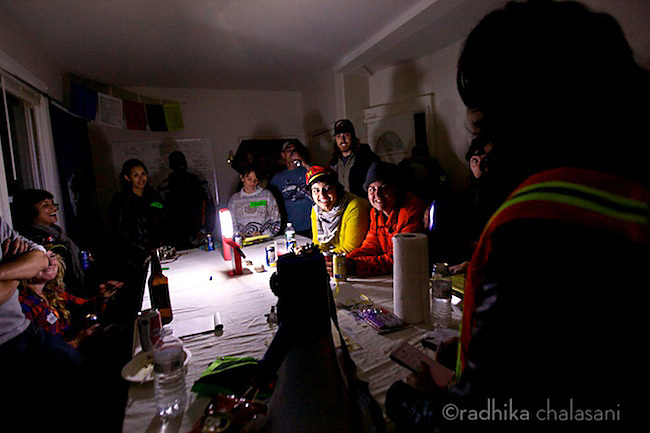 YANA, a worker training community center, became the home to Occupy’s relief efforts in the Rockaways in the first weeks after the storm. It was one of the few places with electricity thanks to a Greenpeace truck that provided solar power. Wayne Gearin, a 40-year resident of the Rockaways, lost his home to a fire the night of the storm and immediately started volunteering with Occupy Sandy. Here he directs traffic on Rockaway Beach Boulevard outside YANA. Gutting YANA because of storm damage. Sofía Gallisá Muriente and others in a nightly briefing about problems and local needs in a house behind YANA that was loaned to them. Connor Gibson from Greepeace and Katie Finnegan participate in a meeting for Occupy Sandy organizers. Gibson drove a Greenpeace truck that provides solar power up from D.C. late last year to Zuccotti Park for the Occupy Wall Street protestors. 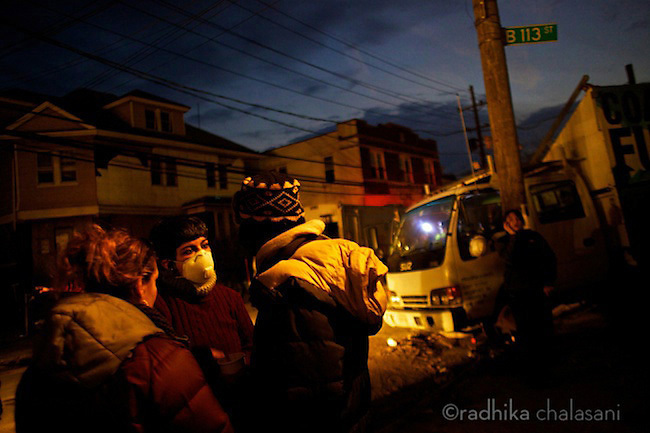 When Occupy organized a relief response to Superstorm Sandy Greenpeace provided the same truck for the Rockaways. Finnegan came from her farm in upstate New York in the first days after Sandy struck to help and has been in the Rockaways since then. Sofía Gallisá Muriente, Diego Ibanez and Jessica Roff have an impromptu morning work session in a house loaned to Occupy Sandy to help with relief efforts. Several of the volunteers have been sleeping there . Ibanez is a labor rights activist and Roff is a lawyer. 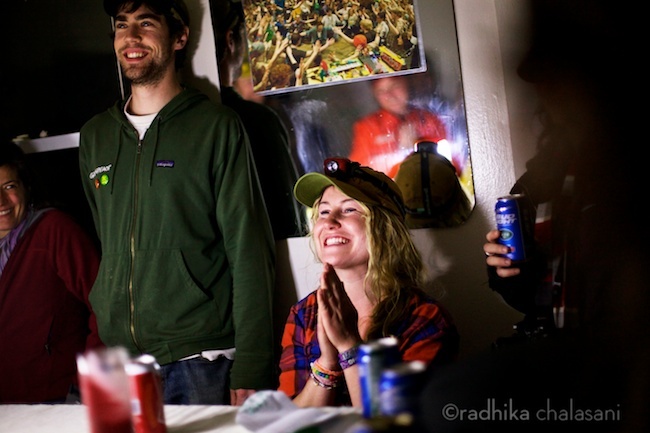 Subscribe to comments with RSS or TrackBack to 'Occupy Sandy I Rockaways'. The days and nights of solidarity have trans-formative powers that have radiated heat through the coldest hours. Although the need is still great, what is also great is this window of opportunity for the community to address key issues within it – something that was not possible before the storm. thank you for your dedication and your work in capturing the powerful images in this struggle of human exploration.